Lille Europe . . .
Lille Europe is a high-speed train hub in Northern France where travellers from the UK can change from Eurostar onto a direct TGV high-speed train to Lyon, Avignon, Marseille, Cannes, Nice, Bordeaux, Brittany, Nimes or Montpelier. It's an easy same-station change, avoiding the need to change trains & stations in Paris. These TGVs bypass the French capital using the high-speed line through Charles de Gaulle Airport and Marne la Vallée (for Disneyland). Lille Europe is one of two main stations in Lille, it sits astride the London-Paris/Brussels high-speed line just 450m from Lille's original station, Lille Flandres. It is served exclusively by high-speed trains, all regional and local trains use Lille Flandres. Here you can see two of the four platforms at Lille Europe, with the main concourse at high level on the right, built over the top of the two through tracks used by non-stop trains. The other pair of platforms are out of shot to the right, on the far side of the central concourse and the through tracks. The glass wall on the left is the wall facing the city centre. If you are changing trains at Lille Europe, allow at least 20 minutes between trains on the outward journey from London. Allow at least 40 minutes (which includes the 30 minute Eurostar check-in) on the return journey back to London. It's usually a same-station change between Eurostar and an onward TGV at Lille Europe, but a handful of onward trains leave from Lille Flandres station 450m away, and then you need to allow time for the 6-minute walk, see Lille Flandres information here. When you arrive by Eurostar from London, you simply take the escalators or lifts from the platform directly up to the main concourse - there are no formalities to go through as passport control has already been done before boarding in London. Check the indicator boards to see what platform your onward trains leaves from. Changing trains is a simple process that can take as little as 5 minutes. When you leave Lille by Eurostar to London, you need to go to the small Eurostar terminal at the north end of the central concourse, Hall 4. It's clearly signed and you'll see the usual Eurostar check-in gates at the entrance to the small departure lounge. Scan your ticket barcode to get through the check-in gates, go through the brief X-ray & metal detector security, have your passport checked then wait in the departure lounge. In theory check-in closes 30 minutes before each Eurostar departure, in practice they know when a connecting TGV is coming in late with passengers making connections, and you'll usually still get through even 15 minutes before your Eurostar departure, if that is necessary because of a delay. Inside the Eurostar departure lounge there is a small shop selling snacks & drinks and there are toilets. There is no Eurostar business lounge at Lille Europe. When the Eurostar approaches Lille, announcements are made, doors are opened on the far side of the departure lounge, and you go out of the lounge down escalators or lifts onto the platform, just before the London-bound Eurostar comes in. Tip: Remember to look at the 'Composition des trains' indicator boards on the platform to see where to stand on the platform for your car number, to avoid running up and down like a headless chicken. If you need to leave your bags, there's a staffed left luggage office hidden away at the extreme south end of the concourse, see the luggage lockers page for prices & opening times. There's a ticket office in the centre of the central concourse. There is no ATM at the station, but you'll find some if you wander towards the city centre. There are car hire offices (Europcar, Hertz, Avis, Alamo) on the main concourse towards the southern end. There's WiFi on the station, but it must be paid for. You'll find the usual range of sandwich shops and snack kiosks at Lille Europe station. In the station itself, my favourite place to wait is at O'Conway's Irish Pub which does food as well as coffee and beer. It's on the main concourse a stone's throw from the entrance to the Eurostar terminal. If you've more time, there are plenty of restaurants in the city centre where you'll find moules-frites to rival Brussels. O'Conway's Irish Pub, on the main concourse. 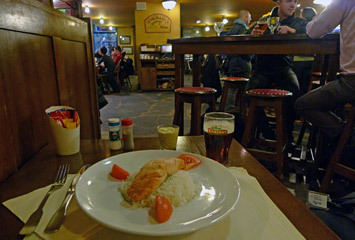 Salmon & a beer at O'Conway's. Supermarkets: There is a small mini-market in the station. There are larger supermarkets in the city centre. If you need an overnight hotel between trains, try Crowne Plaza EuroLille or Novotel Suites Lille Europe, both are at the station itself. Lille is a very pleasant city, great for a short break. The mayor insisted that the high speed line was built through central Lille, whilst mayors in other cities wanted to keep it out of town. Lille's mayor was proved right, as over the last decade since the line was built it has transformed Lille's economy, from run-down mining town to vibrant city of northern France. You can easily pop into the city centre if you have a long wait between trains. Walking: The city centre is an 11-minute 800m walk from Lille Europe. 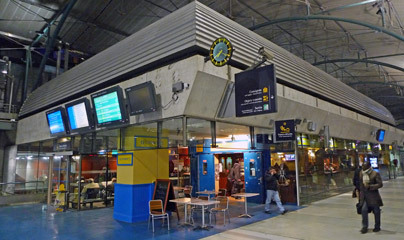 Lille Flandres station is a 6-minute 450m walk from Lille Europe. Walk off the concourse via the main pedestrian exit, down the escalators to the arches underneath the road bridge, and walk straight ahead of you along the main Avenue le Corbusier. See map of Lille showing stations. Taxis: For a taxi fare calculator see www.taxifarefinder.com/main.php?city=Lille-France. Metro: Lille has a small metro network, with stations at both Lille Europe & Lille Flandres, see www.transpole.fr. Lille's original station is a terminus called Lille Flandres, in the city centre an easy 6-minute 450m walk from Lille Europe. One or two TGVs to the south leave from Lille Flandres rather than Lille Europe. Most TGVs to Paris leave from Lille Flandres, as do all regional TER trains including regional trains to Calais and Brussels. To walk from Lille Europe to Lille Flandres, walk off the main concourse via the main pedestrian exit, down the short escalators to the arches underneath the road bridge, and walk straight ahead of you along the main Avenue le Corbusier into town until you come to Lille Flandres station in the city centre. You can't miss it! See map of Lille showing stations. Incidentally, the station facade at Lille Flandres was originally the Gare du Nord station building in Paris, built in 1869-1892. It was dismantled & moved to Lille at the end of the 19th century when a new bigger Gare du Nord was built. The clock and top storey were added when the station was rebuilt at Lille.